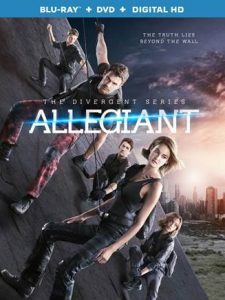 We are huge fans of The Divergent Series and were beyond excited when Lionsgate gave us a chance to watch and review the Blu-ray/DVD of The Divergent Series: Allegiant. The Blu-ray/DVD comes out TOMORROW, July 12th and you can get your copy HERE. Also, if you haven’t yet seen the film (Where have you been?!) you can check out our review of the film HERE. This was a short special feature that outlined the process of taking the book and adapting it to film. One point that is very important and stuck out to me was that they touched upon Veronica Roth’s involvement and her trust in them to make the best movie out of the world her book created. Their primary concern in deviating from the book in this adaptation is that the characters had to remain the same characters. They talked extensively about the bureau and how the director really pushed to showcase the details that highlighted the distinction between the haves and the have nots in the film. They also talked about how they introduced technology that wasn’t in the book (like the aircrafts) and why they took the film in a more futuristic direction than the book. This feature offers a look at the battle that ensues when Four figures out that he was likely taken on the bullfrog (a type of aircraft) to be killed. It was so interesting to see how they shot these scenes as it is definitely not your normal set! They shot these scenes in a makeshift, suspended in the air, thing that they called a “gimble” (Editors note: I have NO clue if I spelled that word right!) This device was brought in from Los Angeles and gave the ability to move the base around. The device could easily allow for the camera and floor to dip left, dip right, take a nosedive, etc. which ultimately gives a more realistic look to viewers. This also includes lots of intense stunts by Theo James – which is always a bonus! This feature outlines the special effects and technologies used to create various parts of the film. One of these areas and where there was a big focus was on the bureau vehicles (including aircrafts) and the details and thought that went into creating them. When they shot these scenes they were again shot on a “gimble” which allows the actors to get a better feel of how the scene will actually look. It also made it possible for cameras to get the accurate angles. Another effect that was interesting to see how they filmed it was the energy fields that Tris, Four, Caleb, Peter and Christina floated on – which later attached to the aircraft. It was a cool dynamic to watch the actors sitting on these makeshift tracks as they filmed, with a lot of green (technically blue in this case) screen. This also involved a lot of wirework. The orange memory erasing “gas” was also interesting to see. Special effects created something that was actually more similar to a powder. This substance was safe for the actors and really allowed more flexibility in what they could create visually. The three different types of drones and their functions were also explained in this feature. Zoe Kravitz pointed out here the progression in the characters – in Divergent they were learning simple things like combat, how to throw knives, etc. By Allegiant, they are learning how to operate these complex aircrafts and drones. This feature looks at conflict among these characters when they are under high stakes. Evelyn is highlighted first and the actors extensively talk of her inner conflict as well as her (very flawed) dynamic as a power figure. Next up is Edgar which offers a unique look into the dynamic between Four as Evelyn’s biological son and Edgar who acts as a sort of surrogate son to Evelyn. David’s passion is also a focus here with his questionable motives. This feature is about the bond the cast shares and how they have all become like family. It’s really sweet to see the actors talk about one another and hear of their excitement about getting back together each film. There’s also a highlight of the new characters – Nita (Nadia Hilker), Matthew (Bill Skarsgard) and David (Jeff Daniels) – and how they bring a fresh, new dynamic to the film. Audio commentaries are always a favorite of mine and this one does not disappoint. To point out the highlights would take an entire new article, so I will simply say WATCH IT! Audio commentary with actors are great, but producers offer a unique look behind the scenes that you wouldn’t otherwise know as actors don’t always see this side of the filmmaking process. This audio commentary offers further insight into the the choices made behind the changes from Veronica’s book, the creative process on how to adapt it, which scenes to include, tidbits on the actors/characters and so much more. It’s always refreshing to hear stories that come out in audio commentaries, and you do not want to miss the ones told here! 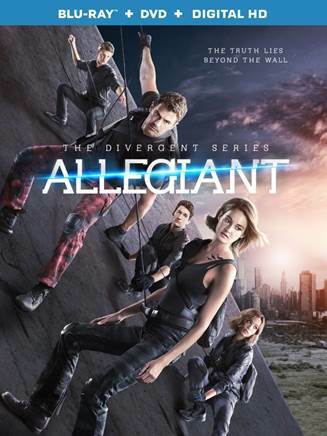 To order your copy of The Divergent Series: Allegiant on Blu-ray or DVD CLICK HERE! !